【EASY TRANSITION】 Smooth gas spring hovering system. A little squeeze on the handles, sit to stand in a matter of seconds. 【LARGE SURFACE】36" x 22" tabletop. Easy to fit two monitors or a laptop and one monitor with enough space for pens, papers, coffee cup, etc. 【DUAL-TIER】Separate keyboard tray. 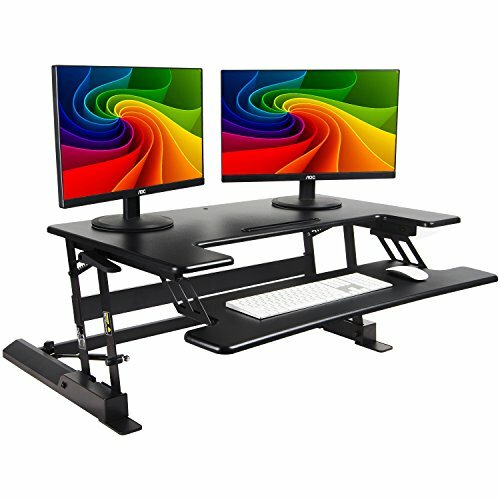 Reasonable height difference from desktop helps keep your shoulders and neck relaxed. 【TABLET HOLDER】Ergonomic design. Keep your smartphone or other devices at an easy viewing angle and within arm's reach at all time. 【READY TO BE USED】Come preassembled. Optional padding pieces for better stability. Place on your office desk and start organizing your workstation!